Both in the past and more recently this stitch (also called C2C) has been used specifically to work from one corner of a square blanket to another. 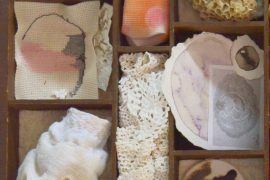 Although a few designers have used the stitch more creatively, it hasn’t been common to see crochet accessories based on box stitch. 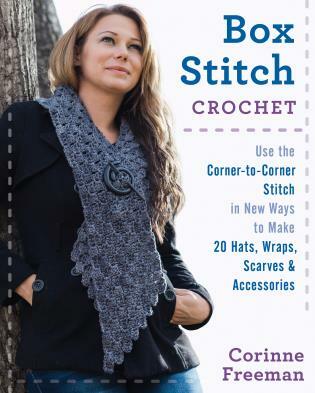 Corinne Freeman has done just that with her crochet book – Box Stitch Crochet: Use the Corner-to-Corner Stitch in New Ways to Make 20 Hats, Wraps, Scarves, and Accessories. That detailed subtitle tells you exactly what you will get from this crochet book, so let me just elaborate on what I liked best inside. I really appreciate when a table of contents or index in a crochet book has images of the crochet patterns instead of just their titles. This allows you to quickly and easily see exactly what options you have to crochet in this book and where to find those items in the pages. It shows great thoughtfulness in the design of the book. The thoughtfulness extends to the crochet patterns themselves. 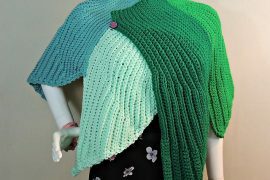 Each crochet pattern has detailed instructions that don’t just include the row-by-row information for crafting the accessories but also have great photos, drawings, and extra instructions to make it easy for you to work with the patterns. Of course, before you can follow the patterns, you need to know how to crochet the box stitch. It is a stitch pattern that is easy to learn. In a way, it’s a variation on the granny stitch; it uses clusters of double crochet stitches, although they are worked in a more creative way than a granny square. That said, there are extra things you can learn about C2C crochet and you learn them here from detailed instructions with photos. You will learn the common increase and decrease that makes a square along with how to adapt this to create a rectangle, how to add a softer beveled edge, how to make a small motif using the stitch, and options for joining these motifs. I very much appreciate crochet authors who take time to fully explore the themes of their books. It sounds like this book is a great learning tool because of the analysis of the box stitch and ways to adjust it as well as showing it being used for a variety of purposes. Thanks for the review, Kathryn. The local book shops in my city don’t carry many crochet titles at all so it is always nice to have publications brought to my attention. Now I know what to add to that ever growing wish list!